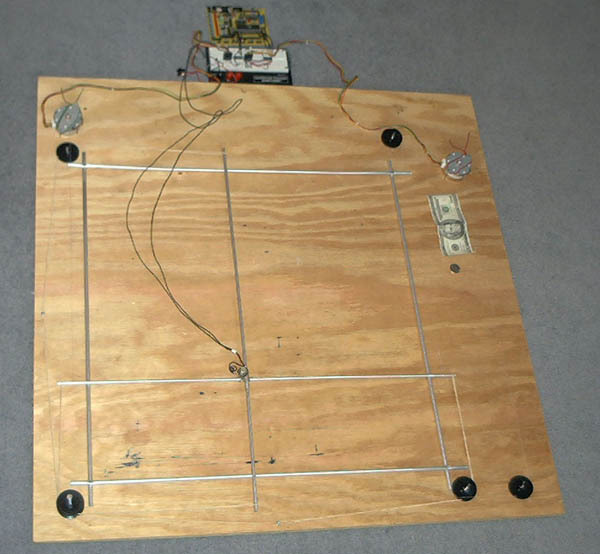 Retro Crazed Engineers build x-y plotter! Seeing the recent infatuation with all things retro, we decided that a 70's era digital pen plotter (with a genuine wood grain finish) would be just the thing to do. So we jumped in head first, and quickly realized why people no longer make large tabletop x-y plotters: they are large, cumbersome, and mechanically difficult to make. "Stop paying for those expensive ink cartridges!" We wanted to be able to make a plotter, that would work (as close as possible) to a commercially available plotter. That is, it would be able to take lists of points from a computer and then plot them, including the ability to raise and lower the pen. As well, we figured that it would be nice to be able to output standard text. "Act now and recieve a color kit (red, green, and blue pens) absolutely free!"